I love working with tone-on-tone colors. What I particularly enjoy about this recipe is that coloring the Israeli couscous with saffron makes it fragrant and beautifully yellow: it looks exactly like corn kernels, and when mixed with sweet corm, you can't tell them apart. Such fun! Cook the large-grain couscous in stock or water and a pinch of saffron, per the package instructions. Cook the corn in butter and 1 tablespoon of olive oil for a few minutes, until it is just beginning to brown. Season to taste with salt and pepper. Transfer the couscous to a bowl and season with the 3 tablespoons of olive oil, garlic, lemon juice and zest, and additional salt and pepper. 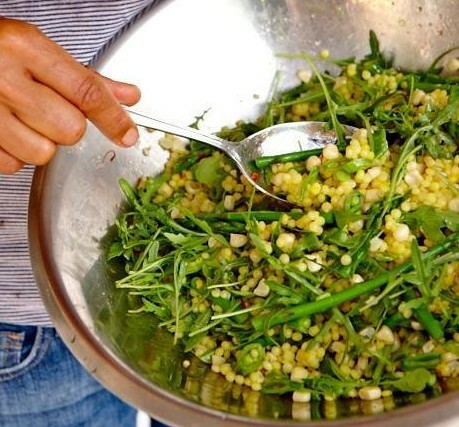 Stir in the cooked corn, blanched sugar snap peas, and parsley. Taste for seasoning and add more lemon juice if needed, because there is no such thing as too much lemon. Serve hot or at room temperature. Not Included in Large Real Food Box: Stock, Saffron, Butter (included in 3-5 box), Olive Oil. Some people use sweet paprika as a substitute for Saffron, if you don't have it.